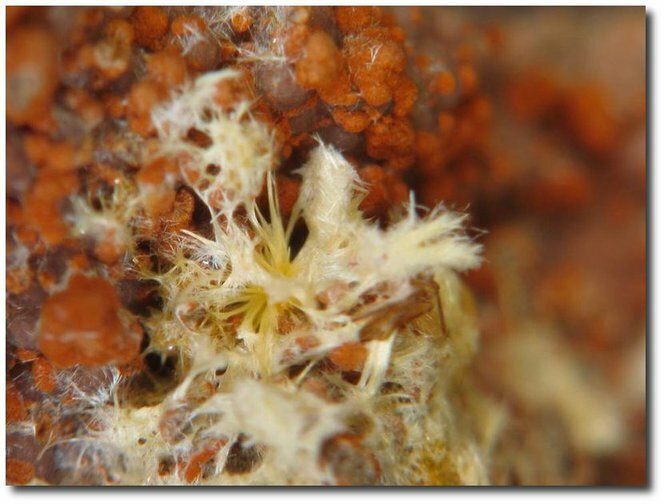 Studtite: Mineral information, data and localities. Named in honor of Franz Edward Studt (or Stüdt) (30 November 1873, London, England, UK - 3 July 1953, Holborn, England, UK), geologist for Tanganyika Concessions Ltd. He prepared an important geological map of Katanga, published in 1913. Dinah Pantic writes in http://www.mindat.org/mesg-7-192418.html. "Frank Edward Studt was my grandfather. He was trained as a metallurgist and graduated from Imperial College in London about 1898. He was English and his parents originally from Germany. After graduating he worked in the Belgian Congo for about 20 years for a Belgian company. I have many of his original diaries from this time." A rare secondary uranium mineral containing a peroxide group in its crystal structure. Crusts and radial aggregates of flexible, fibrous crystals. Uranophane 9 photos of Studtite associated with Uranophane on mindat.org. Fourmarierite 7 photos of Studtite associated with Fourmarierite on mindat.org. Uraninite 7 photos of Studtite associated with Uraninite on mindat.org. Phosphuranylite 6 photos of Studtite associated with Phosphuranylite on mindat.org. Becquerelite 4 photos of Studtite associated with Becquerelite on mindat.org. Lepersonnite-(Gd) 4 photos of Studtite associated with Lepersonnite-(Gd) on mindat.org. Baryte 3 photos of Studtite associated with Baryte on mindat.org. Rutherfordine 3 photos of Studtite associated with Rutherfordine on mindat.org. Uranophane-β 2 photos of Studtite associated with Uranophane-β on mindat.org. Curite 2 photos of Studtite associated with Curite on mindat.org. 4.GA.05 Paraschoepite UO3 · 2H2O Orth. Vaes (1947) Bulletin société belge de Géologie, de paleontology et d’hydrologie, Brussels: 70: B 212. Palache, C., Berman, H., & Frondel, C. (1951), The System of Mineralogy of James Dwight Dana and Edward Salisbury Dana, Yale University 1837-1892, Volume II: Halides, Nitrates, Borates, Carbonates, Sulfates, Phosphates, Arsenates, Tungstates, Molybdates, Etc. John Wiley and Sons, Inc., New York, 7th edition, revised and enlarged: 275. Walenta, K. (1974): On studtite and its composition. Amer. Mineral., 59, 166–171. American Mineralogist (1974): 59: 166-171. Čejka, J., Sejkora, J. and Deliens, M. (1996): New data on studtite, UO4•4H2O, from Shinkolobwe, Shaba, Zaire. Neues Jahrbuch für Mineralogie, Monatshefte (1996): 125-134. Burns, P.C. and Hughes, K.-A. 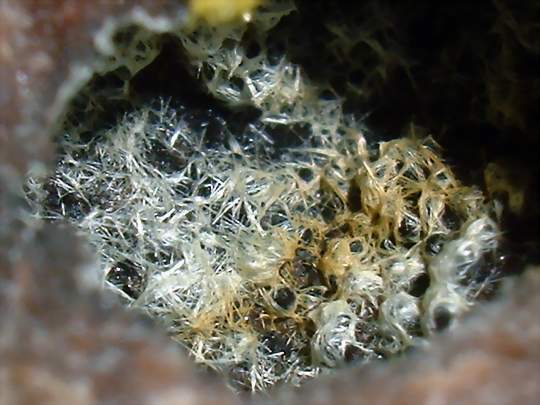 (2003) Studtite, [(UO2)(O2)(H2O)2]H2O: the first structure of a peroxide mineral. American Mineralogist: 88: 1165-1168. 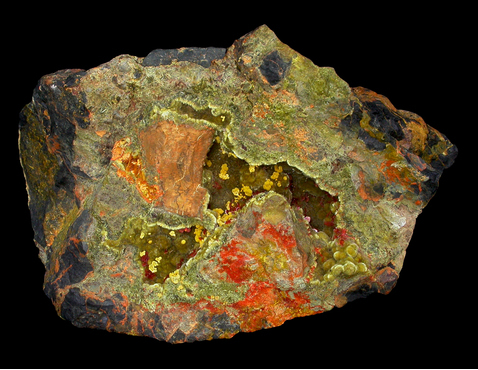 Chen Zhangru, Huang Yuzhu, and Gu Xiaofa (1990): A new uranium mineral - Yingjiangite. Acta Mineralogica Sinica 10(2), 102-105. Am Min 59 (1974), 166; Čejka, J., Sejkora, J. and Deliens, M. (1996): New data on studtite, UO4•4H2O, from Shinkolobwe, Shaba, Zaire. N. Jb. Mineral. Mh. 1996, 125-134. Deliens, Michel (1992): Occurrence de roubaultite à Kamoto (Shaba, Zaïre). Bulletin de l'Institut Royal des Sciences Naturelles de Belgique. Sciences de la Terre. 58, 295-296.